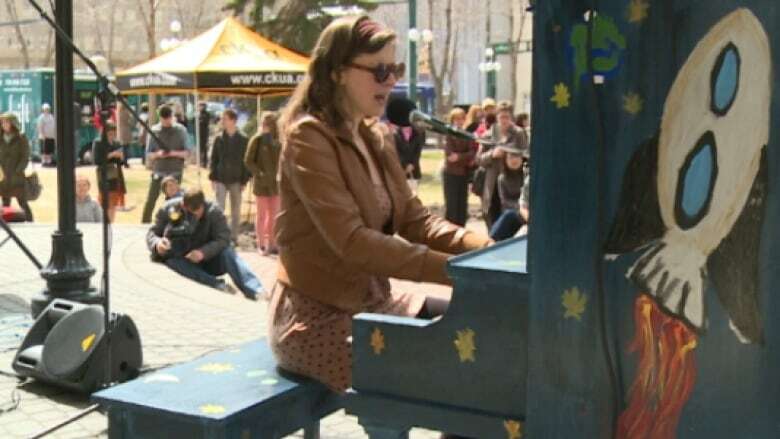 Pianos will be placed outdoors around Edmonton this summer to help liven up public spaces. The initiative known as #OpenPianoYeg was launched Friday with two brightly-painted upright pianos in the park next to the Alberta Hotel. “I want random people to play, I want really great people to play, I want really bad people to play,” said founder David Rauch, who also works in planning for the City of Edmonton. Edmonton singer and musician Colleen Brown played the first song at Friday's launch. She believes having pianos in public spaces will let people play whenever the inspiration strikes. “Seeing a piano can really inspire a person to think: ‘Oh, maybe I can do something here,” she said. Rauch, who moved from Chicago to Edmonton late last year, pulled together his initiative in a month. Three more pianos will be placed around the city later this summer and be made available for a month and a half. There are plans to record songs played on at least one of the pianos and post the audio on Twitter.